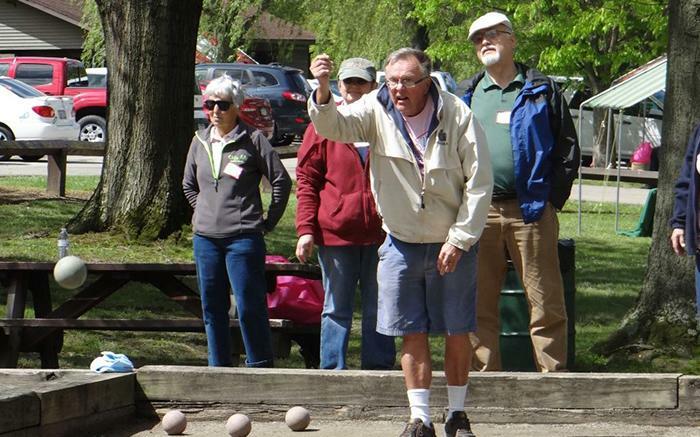 The 2019 Westmoreland County Senior Games will take place May 7-17 at Mammoth Park and several other central Westmoreland area locations. Any person 50 years of age or older is eligible to participate in any of the thirty-two events. Westmoreland County residency is not required to participate in the events. Registration for the Senior Games costs only ten dollars. All pre-registered participants will receive a Senior Games t-shirt, and a free picnic lunch. A few of the events include high and low impact activities, such as bocce, bowling, canoeing, cycling, darts, golf, horseshoes, running, shuffleboard and swimming. Many of the events will divide athletes into age brackets: 50-59, 60-69, 70-79, 80-89, and 90 plus. Medals are awarded to the top three finishers in each event and age bracket. For over thirty years, the slogan of the Westmoreland County Senior Games has been “Bring a Friend for Fun and Fitness.” The games are more about fun and fitness than serious competition, and one does not have to be a super athlete to participate. Most of the participants come for the camaraderie of the games and enjoy competing with friends and meeting new people. The ultimate goal of the games is to encourage an active lifestyle and continued participation in recreational activities beyond age 50. To request a registration booklet, call the Westmoreland County Bureau of Parks and Recreation at (724) 830-3950, or download one online by visiting the County Parks' website.